Is it Worthwhile to Carry a Shooting Range Bag? Explorer has been in the bag business since 1994. 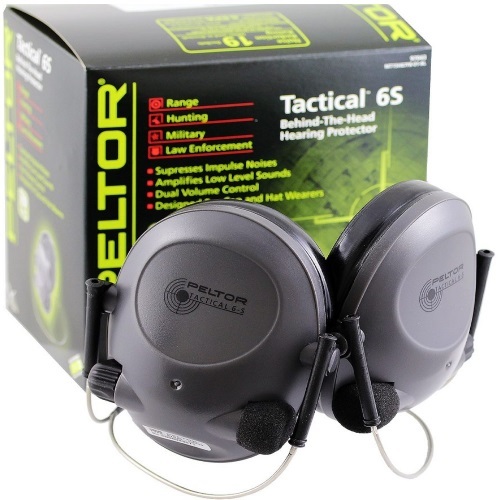 They have a great line of quality storage solutions and firearm accessories. On their website, you will be able to find pouches, packs, cases, holsters, vests, bandoleers, and even wallets and purses. 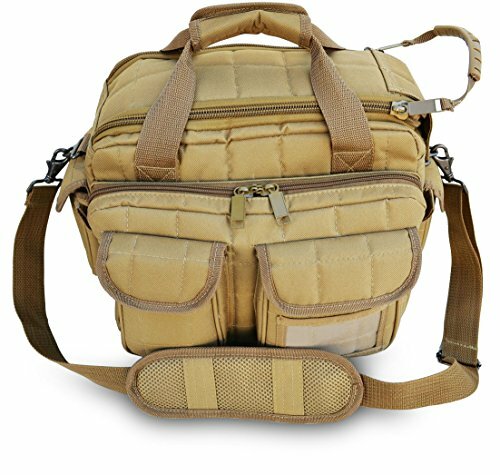 There are bags for law enforcement personnel, military personnel, medical personnel, and everyday civilian men and women. Two of their most popular items are the Explorer Tactical 12 Pistol Padded Gun and Gear Bag, and the Range Ready bag (sold on Amazon as product name “Explorer Large Padded Deluxe Tactical Range Bag”). The gun and gear bag is a perfect size. It is large enough to hold any and all essential range (or duty) items. The bag manages to be small enough to easily be used in a variety of situations: in the field, on duty, or simply thrown in the back of your car as an on-the-go kind of bag. There is a lot of padding, which ensures that all sensitive objects are well-protected. Furthermore, the large number of pockets, loops, and compartments makes certain that everything is in its right place. When organized properly, this bag is a huge time saver. The bag comes with a detachable shoulder strap – also padded – which can be removed with ease and speed. There are also two carry handles. Altogether, there are 13 different compartments in the gun and gear bag. You can tell that Explorer definitely had tactical use in mind when designing this product. There are dual zippered exterior front pockets, as well as an ID pocket. The bag includes elastic loops for attaching any kind of accessory. For smaller items or objects, there are two side pockets on both ends of the bag. This bag is ideal for two handguns, and to facilitate that there are two gun pockets with a center support strap. A large front compartment is available for any additional weapons or gear which the owner may need. The main compartment has a roll-up, double-zippered flap, which comes with a hook and loop fastener. This bag is constructed of 1000 D heavy-duty ballistic nylon. It loses a bit of the flexibility which the 600 D polyester has, but it is very strong. This is part of what makes Explorer bags so popular. People know that durability is the name of the game with Explorer, and they appreciate it. 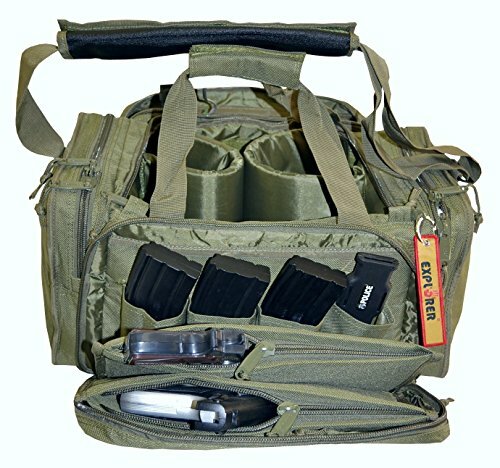 The gun and gear bag comes in a variety of colors, so it can really fit a large number of people and purposes. The Rangemaster gear bag is made of 600 D polyester. This gives you the makeup of a great bag, which can handle a lot of weight and last up to a lifetime. It comes with a padded shoulder strap, and two padded carry handles. Every compartment is lockable, and to that end there are two heavy-duty zippers which can fit a lock through them. The rear compartment has four magazine pouches, and the front one has seven magazine pouches. The main compartment comes with removable dividers, which can be completely removed or arranged to the liking of the owner. Customization can add a lot to a bag, and it can help you make it your own. This way, you know exactly where everything is, all the time. The Explorer Rangemaster is THE range bag. 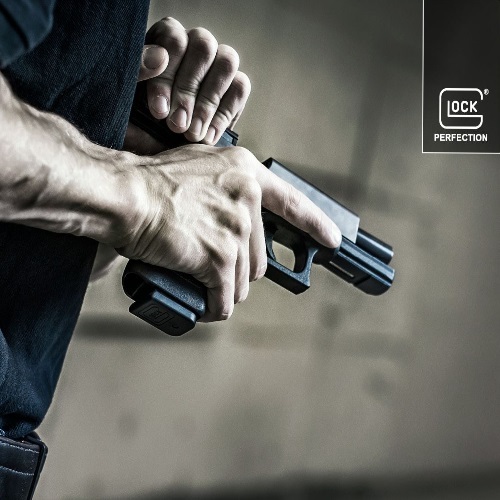 It is designed for carrying multiple pistols to the range, along with any essentials, accessories, and tools – things like brushes, pens, targets, lube, oil, rags, or extra ammo. Everything you need. Part of what makes this bag the ultimate range bag was that it was designed and constructed based on actual feedback from range instructors, police officers, and SWAT. This means that once you arrange your bag the way you like it, it is all safe, secure, and ready for action. There is some additional plastic at the bottom of the bag. Padding is everywhere, because Explorer cares about the safety of your valuables, firearms, and accessories. The zippers on this bag are top quality, as is the stitching. It can take a lickin’ and keep on tickin’. Although, if your bag is ticking, there may be something wrong… the point is, this bag may be the only one you will ever need. Fit for the range, the field, the woods, or the back of your car. True to their name, Explorer is constantly exploring. They are always looking for the best materials, the best designs, and the best manufacturers, in order to produce the finest bags and packs the world has seen. Explorer’s bags are shipped all over the world, and they are famous for their stability and ability to take abuse without failing. These two bags are very roomy, and you can probably even carry four or five handguns in it. 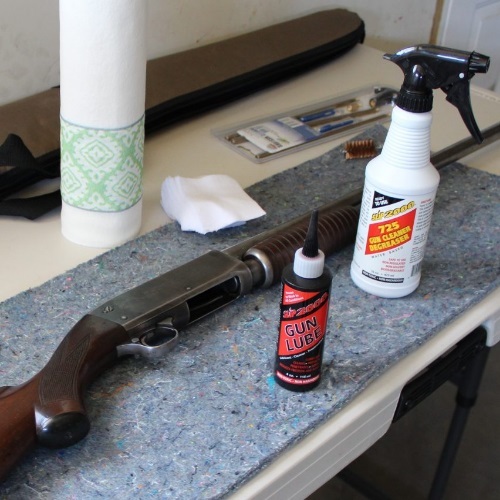 You may need to purchase additional pistol rugs, but it can be done with no problem. As for the price: the gun and gear is about $50, on average. The Rangemaster is about $45. These are very reasonably priced, and the value is unquestionable. Getting what you paid for? That’s normal. Exceeding the customer’s expectations? That is talent. Explorer does have bags which are a lot more expensive, but when it comes to the everyday shooter – either one of these bags will be more than enough for a nice day at the shooting range. Some consider a range bag to be luxury. I don’t feel this is really accurate. Could you technically survive without one? – yes, you could. You could also take your guns and ammo to the range in a black garbage bag, if you want to. But if you are serious about gun ownership and serious about training with your weapon – perhaps this Rangemaster Explorer bag review has encouraged you to do some more research, go the extra mile, and order yourself the proper range bag for you. It makes a big difference, and it is an investment which is worth making. Slip 2000 Company and Products Review: Don’t Slip, Get Slip!